Register today for only $20 (Breakfast and Lunch will be provided). Onsite registration will be available. Are you ready to transform your idea into a profitable business? Ready to take your start-up to the next level? 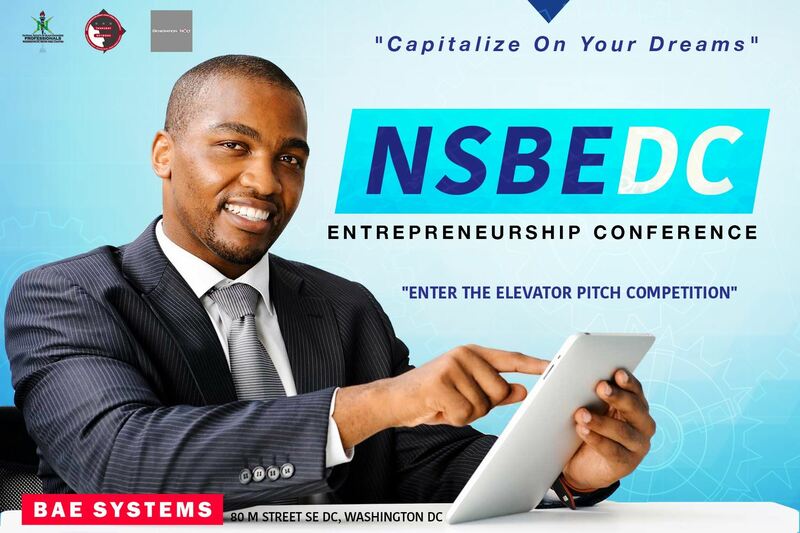 Then join NSBE DC, Thursday Network, and Generation-Next for a day of interactive workshops and plenty of networking opportunities with DC's premier entrepreneurs at the 2016 Entrepreneurship Conference! Pitch your concept for instant feedback and a chance to win prizes! 1st place prize includes: $150 cash prize, a 30 day Generation-Next Startup Bootcamp, a 2 hour Legal Session, and up to a $100 credit towards General Assembly seminars! http://tinyurl.com/2016-COYD-elevatorpitch. Email PD@nsbedc.org for details on the Competition! For more information, contact the Professional Development Chair at pd@nsbedc.org. 3. Is there parking available? There is available street parking around BAE systems. 4. How do I find out the latest news about the 2016 DC Entrepreneurship Conference?